After my first day of teaching, I cried in my office for two hours. It was the most stressful and exhausting day of work I have ever endured. I wondered how on earth I would get through a whole year of such agony. Why had I ever thought I wanted to be a teacher? I laid on the floor, reliving the horror of each “Welcome to my class, here’s the syllabus” lecture I had given. The bored faces. The slow ticking of the clock. The crushing realization that no one could rescue the situation but me. But that day I had a realization. I was not meant to be the kind of teacher who stands at the front of the room and talks. Not for long, anyway. I’m an introvert. And once I realized what that meant for me as a teacher, I think it’s been an asset for me. 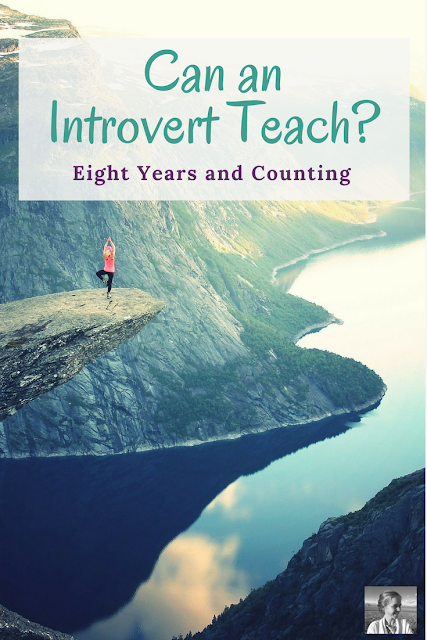 As an introverted teacher, I have constantly searched for ways to present the material to my students in dynamic, creative ways. Ways that keep me out of the spotlight. In my first year I tried new student-centered pedagogies every month. We studied poetry through performance pieces and poetry slam. We studied The Adventures of Huckleberry Finn using the Harkness discussion method, and learned a lot about ourselves and how to relate to each other in the process. We produced our own outdoor version of A Long Day’s Journey Into Night, traveling around campus for each act. We divided into two literature circles to study The Great Gatsby and The Sun Also Rises, delving into the 1920s by examining its history, fashion and scandal. We practiced writing through workshops and conferences. Though I virtually never stood at the front of the classroom, I was up late every night preparing, always learning about new ways to teach. At the end of that first year, when I said goodbye, my American Literature students gave me the only standing ovation I have ever received as a teacher. I get teary remembering how much I learned from them. 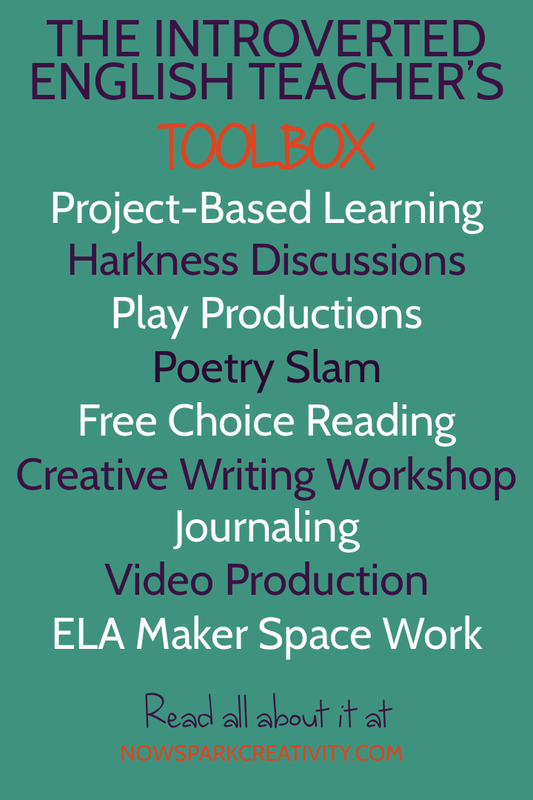 As the years have gone on, I’ve added new options to my introvert’s teaching toolbox. My students have done collaborative work with kids overseas (want to find a partner and try it? Hop into our Facebook group, Creative High School English and post a request!). 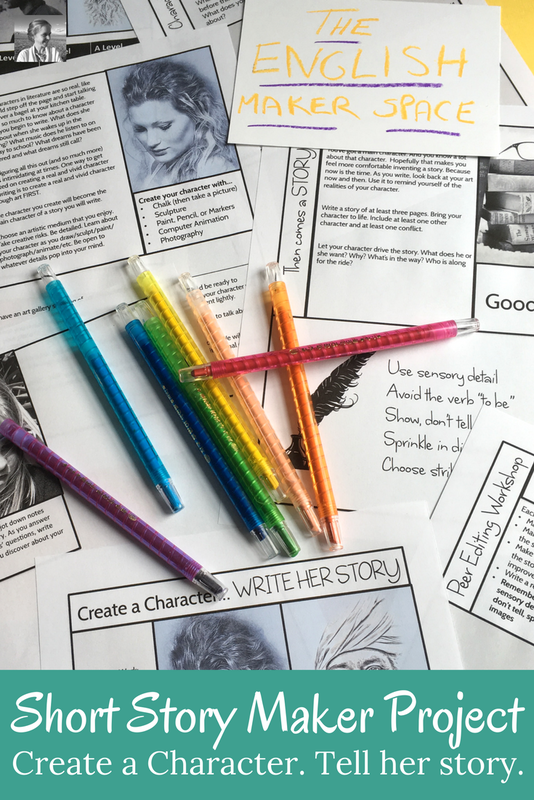 We have created online writing portfolios and blogs. We’ve done literature-inspired art shows and lunchtime poetry jams. We’ve performed our own Canterbury tales on our own pilgrimage and produced live radio shows. We’ve had reading festivals and reading contests, acted out Shakespearean scenes in costume and done theater workshops with a guest artist. Most recently I've been exploring English maker spaces as another way of putting together the materials and environment my students need to launch their own creativity. This is just another lovely way we introverted teachers can guide our students without the intensity of the spotlight. 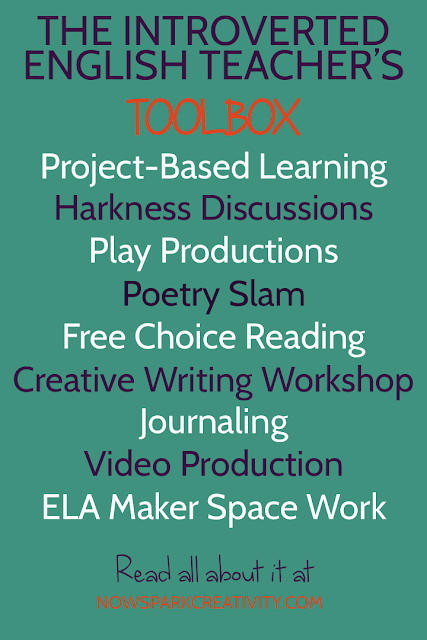 I love what I'm learning about the maker movement, and have just finished building curriculum for a maker project you can find right here if you'd like to try it out quickly and easily. I’m generally to be found at lunchtime eating alone at my desk, taking a break from it all. Sometimes I am worn through at the end of a teaching day from absorbing so many emotions and thoughts from my creative and occasionally grumpy and tired band of kids. But though the teaching profession presents its challenges to me, as an introvert, I truly believe that what first seemed like a weakness has become one of my greatest classroom strengths. Students get enough lectures. I have other gifts to share.